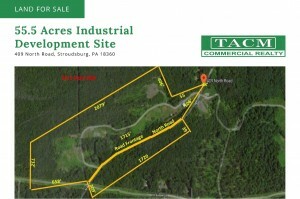 55.5 acre Industrial zoned property. Improved land just minutes from Interstate 80, less than 2 miles. One warehouse facility on site with on lot sewer and water. Two gated access points from North Street. Prior use by owner was a landscaping material manufacturing sites. Former Superfund site located next to the property. Some prior engineering completed for clearing and construction of additional buildings. 2,000 SF 2 bay warehouse facility located on the site. Contact us for more information about this listing.